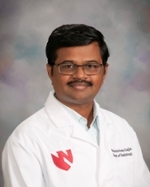 UNMC › Radiology › Faculty › Balasrinivasa Rao Sajja, Ph.D.
Sajja BR, Narayana PA, Wolinsky JS, Ahn CW, and the PROMise Trial MRSI Group. Longitudinal Magnetic Resonance Spectroscopic Imaging of Primary Progressive Multiple Sclerosis Patients Treated with Glatiramer Acetate: Multi-Center Study. Mult Scle. Vol. 14, pp. 73-80, 2008.